This is the official EUD Editor 2 from DeliciousBingsoo (KOR), who is also the developer of EUD Editor 1. File hasn't been altered in any way. This is straight from cafe.naver.com/edac which requires you to be a Korean citizen to become a member. It's set to Korean by default but you can go to settings and change it to English. You must restart the program. This is the latest tool you need to take your map making to the next level. Good luck! Post has been edited 19 time(s), last time on Oct 27 2018, 3:19 am by lifebot. I've had a look through what this can do, I'm not quite ready to move to this for my EUD editing but I think I probably will shortly. First, when you unzip it, you may need to go and edit a directory name to be in Korean, for me either Winrar or Windows corrupted the korean text so the program couldn't find it's data. Under Data\Language you may need to rename the directory with garbage + (Korean) to be 한국어(Korean). When I was clicking through the menus I managed to update it to what seems to be a newer version, and it remade the directory with the wrong name (but 1 extra file), and there's also a directory just in the base directory with garbage characters; after the update there is now a second directory here with unfortunately a different name. I don't know the proper name for these though - I grabbed the previous string out of the error dialog. Perhaps if I try and use the editor it'll give me an error somewhere about these directory names not matching, too. The interface is a little annoying, it's sort of got separate tools glued together and you can't just flip between them like in the old version. It forces you to load a map, and all data is then from the map - so when you look at unit.dat properties like weapon damage, it will use the values from your map, not just the default SC values. 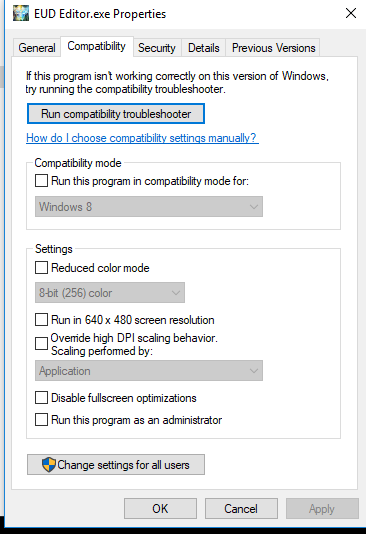 Show trigger view is currently not supported. I suspect it's probably a low priority feature for the developer, since their idea is you just use this tool to inject everything into your map. It has far better support for showing graphics, which for me didn't really work in EUD Editor 1. This will come in more use when/if iscript editing becomes available in a future SCR version. The dialogs are all laid out differently. There are a few minor additions about the data display (like a graph showing x/y offset for weapon damages), but there doesn't appear to be any new capabilities in dat edit or firegraft areas. Flags are better named and cleaned up, though, so it's probably easier to use. The buttonset editor is easier to use and now allows for brand new buttonsets to be created easily, without being forced to overwrite existing ones. There's a BGMPlayer, which seems to be something that will sync up background music for you. No idea how it works. FileManager is where you can get to the Wireframe editing, but it now also supports stat_txt! This is an entirely new feature not present in the old one that is extremely useful, and it previews the text including colours for you. There's a Triggereditor window but it's not translated so I'm not sure what it for, it starts off with BGPMusic stuff. This may be EUDDraft format triggering. There's an "autocompile" option, which I think is supposed to automatically re-inject all the content into your map every time it detects it's been saved by an external editor (scmdraft2), which would certainly make it less cumbersome to use. Ahh, a killer feature! Click on View - Used Data, and it'll tell you all the fields that you've edited! Post has been edited 3 time(s), last time on Mar 26 2018, 4:13 am by Lanthanide. Newer versions now just have Korean and English directories, without all the Korean text in the directory name. Use the auto-update feature to get the new ones. The other Korean directory I didn't know is now called "TEFunction" and contains all of the data for the trigger editor. Most of the trigger editor is still in Korean though. It appears to be exposing EUDDraft trigger capabilities in a semi-GUI layout, so you can do if-then-else constructions, and loops etc. Great find. Good to know directories have been renamed to both English & Korean. "Error opening file: scenario.chk, Program Version: 15.83, SaveFile version: 15.83"
"Unhandled exception has occured in your application. If you click Continue the application will ignore this error and attempt to continue. if you click Quit, the application will close immediately. Project: Index was out of range. Must be non-negative and less than the size of the collection. Parameter name: index." "Unhandled exception has occured in your application. If you click Continue the application will ignore this error and attempt to continue. if you click Quit, the application will close immediately. Value cannot be null. Parameter name: source." "Value cannot be null. Parameter name: source." 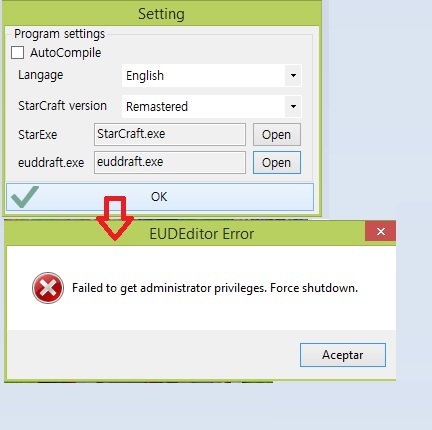 Program Files (x86) - E\Starcraft\EUD Editor 2 0.15.5\Data\temp\stat_txt.tbl' because it is being used by another process." Opening the Project from within EUD Editor and attempting to save, window "Log" hangs on "compile..."
I`m creator this program and please send your file to sksljh2091@naver.com. I had ended up erasing all related files except for the map, and then I started a new map and copied over all terrain and triggers and manually redid all of the locations etc. I tested a copy of the new map and I was able to inject, and from now on I will keep two parallel files, the source map and the injected map separate. I have the files in my garbage can, but because I was experimenting I have several e2s and three sets of .dat files I am unable to isolate which, especially with Finals tomorrow. If I experience a similar issue I will email you a compilation in the future. "Error opening file: scenario.chk, Program Version: 15.83, SaveFile version: 15.83," except for the new 16 version. I get the same "Unhandled exception has occured in your application. If you click Continue the application will ignore this error and attempt to continue. if you click Quit, the application will close immediately. Project: Index was out of range. Must be non-negative and less than the size of the collection. Parameter name: index." error on my Windows 10 PC, my Windows 10 Laptop, and an old Windows XP Laptop. I am currently in direct communication with the developer of the tool, I'll be able to relay any questions/bug reports directly to him so feel free to post here. The latest update appears to be working just fine now, I'll post again if any issues come up. Run it as admin. Shown here. Or right click it and hit run as admin. Are you admin of your computer? If not you can't run things as admin. Also be sure to check for updates on it....And if the update says need to run admin 1st, then you are not admin of that computer.